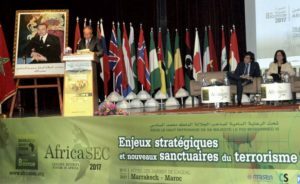 The Religion & Security Council (RSC) participated in the 8th edition of the Marrakech Security Forum (MSF), the leading security event in Africa, organized by the Centre Marocain des Études Strategique (CMES) on February 10-11, 2017. MSF proceedings offered a unique opportunity to encounter and exchange views for over 200 policy makers, civilian and military officials, representatives from international organizations, experts and professionals from Africa, the Middle East, Europe, United States and Asia. In this context, RSC Chairman Emiliano Stornelli and RSC Senior Advisor Amb. Mohamed El Nokaly established partnership relations with prominent think-tank organizations based in different African countries, starting with CMES, MSF promoter, headed by President Prof. Mohammed Benhammou. CMES and RSC signed a Partnership for Africa & the Mediterranean with the aim to support North-South and South-South cooperation in addressing the challenges and threats that interconnect the African-Mediterranean space. – Population displacement, migration crisis, refugee and humanitarian emergencies. – Société africaine de géopolitique et des études stratégiques (SAGES), President Prof. Manasse Aboya Endong, Cameroun.